A story survives in Islam about the vision of the Prophet: a vision or dream, which was an initiation in the higher spheres. Many take it literally and discuss it, and afterwards go out by the same door through which they came in, but from the point of view of a mystic one can find out the mystery it contains. It is said that the Prophet was taken from Jerusalem to the Temple of Peace, which means from the outer Temple of Peace, Dar-i Salam, to the inner Temple of Peace. A Buraq was brought for the Prophet to ride upon. The angel Jabril (Grabriel) accompanied the Prophet on the journey, and guided him on the path. 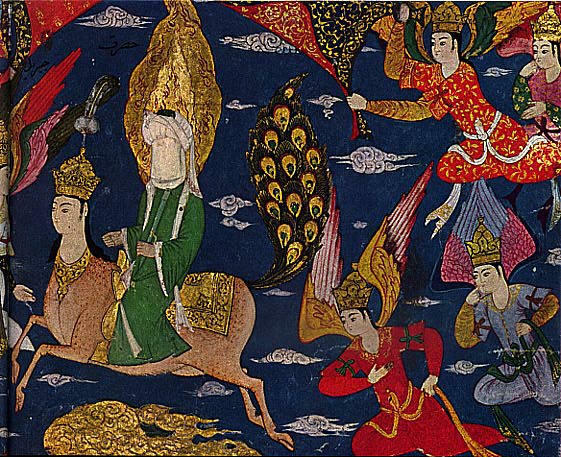 The Buraq is said to be an animal of heaven, which has wings, the body of a horse, and the face of a human being. It signifies the body connected with the mind. The wings represent the mind, and the body of the Buraq represents the human body. The head represents perfection. It also symbolizes the breath. Breath is the Buraq, which reaches from the outer world to the inner world in a moment's time. Jabril, in this story, represents reason. It is said that on his way the Prophet saw Adam, who, looking to one side, smiled, and looking to the other side, shed tears. This shows that the human soul, when it develops in itself real human sentiment, rejoices at the progress of humanity and sorrows over its degeneration. The Buraq could not go beyond a certain point, which means that although the breath takes one a certain distance, in the mystical realization, there comes a stage when the breath cannot accompany one. When they were near the Prophet's destination, Jabril also retired, which means that reason cannot go any further than its limit. Then the Prophet arrived and he called aloud the name of God, saying, 'None exists, save Thee,' and the answer came, 'True, true.' That was the final initiation from which dated the blossoming of Muhammad's prophetic message. Image: http://sufischool.org/prorok.htm, Prophets Ascention to the Presence of God, blessed by the Angels.